In a moving eulogy, Professor Michel Canis honoured the life of his teacher and mentor Professor Maurice Bruhat at the opening ceremony of the 12th World Congress on Endometriosis. 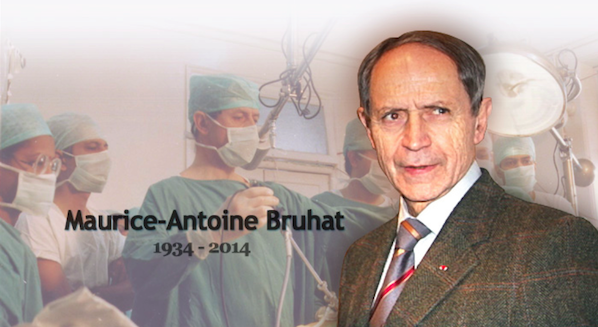 Professeur Maurice Antoine Bruhat suddenly passed away on 25 February 2014, the last Tuesday of that month. He was born on 10 December 1924, in Charbonnier les Mines. From this remote village of Auvergne, he went to Clermont Ferrand where he became a medical doctor and a professor of Obstetrics and Gynaecology in 1971. His carrier really started when he had the opportunity to create the second department of Obstetrics and Gynecology of the University Hospital of Clermont-Ferrand. In 1976 this department was created in an old building – “La Polyclinique” – because the old professor of Obstetrics and Gynecology decided that voluntary abortions would never been performed in his department although this procedure had just become legal. Professor Bruhat arrived there with two residents and a few midwifes. Thirty years later, when he retired, four professors, four assistant professors, three fellows, and five residents were working in this department, which ranked as number 1 in France among gynaecologic surgery departments, and the address of “La Polyclinique” and members of its team were known all around the world. Professor Bruhat travelled a lot. So often, in fact, that one of his fellows once recommended him to buy a house in Paris close to an international airport and to come to work in the department by plane once or twice a week when he was not abroad or busy in Paris! He travelled to many countries particularly to Morocco, where he became director of a French military hospital during two years of his military service. He became President of the French College of Obstetrics and Gynecology, he participated in the juries of national counsel of universities where future professors of obstetrics and gynaecology were evaluated over 20 years. He became Dean of the Faculty of medicine of Clermont-Ferrand in 1997, and founded the French and the European societies of laparoscopic gynaecologic surgery. He was an active member of the French academy of surgery and of the French academy of medicine. Besides numerous distinction awards and papers which cannot be all listed here, I feel more important to remind who he was and why he succeeded in building a « Team » and placing his department on the world map as the birth place and the Mecca of gynecologic laparoscopic surgery. Indeed the doors of the department were always opened to welcome everyone. Among the visitors were H Reich, K Semm, S Matzusaki, S Ratnam, J Phillips, C Levinson, FH Loh, R Rotchorishvili, M Candiani, M Cooper, W Kondo, M Xia, JM Kasia, C Nezhat, I Tapkara, ……to cite everyone would be impossible; some were good friends, other were sometimes strong opponents, but all were welcome as he understood that hospitality is mandatory for everyone when you live in a remote country like Auvergne and you wish to meet people from all over the world! If you came to Clermont in our department, it was highly probable that you would have either a dinner or a lunch with him and that you would have the chance to discuss with him face to face in his office. He is considered by many surgeons as the “father” of endoscopic surgery in gynaecology. nor the man who did the first laparoscopic hysterectomy or even the first laparoscopic radical hysterectomy! He was much more than that. He was the first professor of gynaecology to understand and or to anticipate how endoscopy was going to be important. He was the only one who accepted in his department Hubert Manhes, who started the laparoscopic management of ectopic pregnancy, a “crazy” idea at that time! He understood that a scientific and careful evaluation of our clinical results was mandatory to convince skeptics that endoscopic surgery was the best technique. He travelled in numerous countries and managed to meet important people in gynaecology and in surgery to promote the techniques and to make laparoscopy acceptable. I, for example, remember that our paper about the laparoscopic management of adnexal cysts was “suddenly” accepted in Obstetrics and Gynecology after his meeting with R. Pitkin, who was the editor-in-chief of the journal and a strong opponent of laparoscopic surgery, which he considered as a technical gimmick! He was the best lobbyist of endoscopic surgery. He travelled many times to the US. Indeed for a French team to be recognised there is always considered as an accomplishment. However, the US endoscopic societies were happy to have an active university team among their members to demonstrate that endoscopic pioneers may also have a scientific approach. He was particularly involved in the development of endoscopic surgery in Africa as he was convinced that this continent will be a major player during the 21st century. He travelled to big cities like Beijing, New York, and San Francisco, as well to much less famous places like Puna in India or Oulan Bator in Mongolia. He created one of the first teaching centres for endoscopic surgery in Clermont Ferrand. This center is still very active and much valuable information is available on its website. He understood that it was mandatory to promote all the members of his team, he shared the honours, the papers, and the awards with us, and this was more difficult. Indeed it is more difficult to convince the “experts” and the opponents when the author is less than 30 and sometimes looks less than 25! You also have to be strong, wise, and humble to let everyone know that the “young people” (as he was calling us) may be better surgeons than you are! – the importance of the peritoneum from myself, and many more ………. How many professors of surgery would have accepted the non-suture approach from a young gynaecologist, who was developing endoscopic surgery because he was not qualified in open surgery!?? The development of CO2 laser laparoscopy was another example of his management. The idea of a young fellow became possible, as he was a good friend of the CEO of a company who was developing laser in ophthalmology. Sir, I am convinced that many directors of medical departments wonder how you succeeded to built and to maintain a “dream team”, which included so many talented and hard working surgeons. They should first consider your vision, your ability to understand when meeting a young resident how this newcomer was able to work hard to improve himself so as to possibly become an expert. However the most important word is “trust”; trust for every member of the department including physicians, nurses, and housekeepers. Endometriosis is a good example. Indeed in 1982, you asked a second-year resident to do a review of the literature about endometriosis. The young resident came back with 200 papers and more than 300 hundred references and you decided to use this work to organise the first world congress on endometriosis in November 1986 and to select the speakers from the work of a resident!! This is where WES and most of the modern history of endometriosis started! Without your help and inspiration, I would not have travelled to Melbourne, Salvador de Bahia, Yokoama … and my life would have been much less exciting! You made us work so hard towards excellence that we are considered as experts in our field. On your behalf, I wish all the best to WES, to the Vancouver and the Shanghai meetings in 2017 and 2020. I hope as you would have that care of patients will be improved after these lectures and discussions. I hope that our minds will be as opened as yours, to accept challenging ideas, which may bring revolutions and significant progresses. You would not have answered: “Michel, this is stupid, many studies in the literature demonstrated that it is a chronic disease!” Instead you would have said: “Now, Michel, you have to explain and justify this provocative and controversial idea”. I may or may not have convinced you at the end of my demonstration, but at least you would have listen carefully taking the chance to open a new area! You knew that we have to be open to accept and to discuss every “stupid or crazy” idea to improve our understanding of endometriosis!! May I finally say to every member of WES that you were very fond of classical music, particularly of the “Orchestre d’Auvergne”, that you loved horses and rode them every sunday morning, that you never missed a match of the French and of ASM (the Clermont Ferrand) rugby teams. You also liked very much big parties and I guess that those who went to Lafayette castle during the 1st World Congress on Endometriosis still remember it. Moreover every member of your department will never forget the parties organised every December where the residents and even seniors were presenting sketches and videos to caricature your and our habits, faults, and tricks!! Thank you Sir. In the 18th century you would have been described as an “honest man”. One of your patients told me a few weeks after you passed away: he was really “a beautiful person”. For us, you were and will remain “the Boss”, “le Professeur”! !